Biotechnology Market size was valued at USD 399.4 billion in 2017 and is expected to witness 9.9% CAGR from 2018 to 2024. Surging incidence of chronic ailments such as diabetes and cancer worldwide will increase the demand for biotechnology products over the forecast timeframe. According to the International Diabetes Federation, in 2017, diabetes affected more than 425 million individuals worldwide and is estimated to rise up to 629 million by 2045. Additionally, the proportion of type 2 diabetes in people is rising in many countries thereby, such high proportions are expected to boost the market growth. Wide-ranging applications coupled with growing demand for effective drugs and vaccines should favor business growth. Improving healthcare access in areas of unmet medical needs and growing R&D expenses for biotechnology advances will spur revenue size. Moreover, rising demand for agriculture based products and growing demand for biotechnology practices in clinical research will endure to foster biotechnology industry growth. However, risks associated to genetic information can hinder the market growth in upcoming years. Biopharmacy segment dominated the overall market and accounted for 61.7% revenue share in 2017. 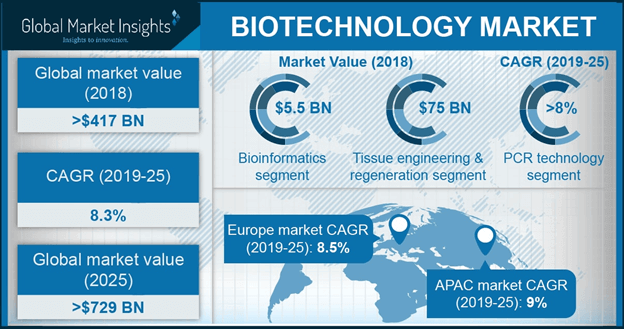 Biopharmacy segment is anticipated to grow in forthcoming years due to increasing usage of bio-recombinant proteins in several vaccines to treat numerous diseases. Biopharma companies focus on advancement of personalized medicines that should further boost segmental growth. Bioindustrial segment is projected to show significant CAGR of 9.3% over the analysis timeline. High segmental growth is attributed to rising usage of bio enzymes and biochemical for various chemical procedures. 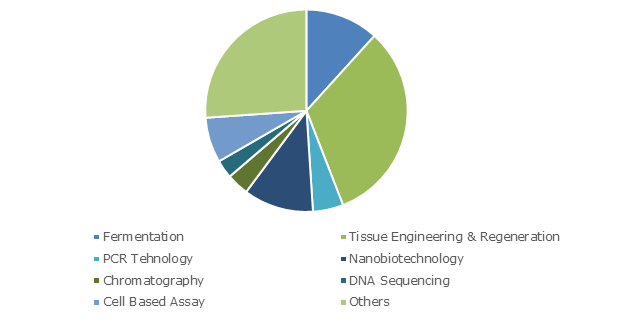 Tissue engineering and regeneration segment was valued USD 123.4 billion in 2017 and is projected to show similar trend during the forecast period. Increasing demand for tissue engineering and regeneration coupled with advances in tissue engineering filed boosts segmental growth. PCR technology segment held substantial revenue share in 2017 and is projected to witness 9.3% CAGR over forthcoming years. Widespread applications of PCR technology in the field of life science, forensic science and clinical diagnostics that is expected to foster business growth. U.S. market was valued at USD 96.4 billion in 2017 and will grow considerably during the forecast timeline due to growing prevalence of chronic ailments. As per Center for Chronic Disease Prevention (CDC) updated October 2018 data, 6 in 10 adults in the U.S. have a chronic disease. Favorable government policies and ongoing technological advancements will accelerate biotechnology industry growth. China market is projected to witness substantial CAGR of 10.6% during the forecast period. High growth is attributable to increasing incidence of chronic diseases as well as innovative technologies in biotechnology sector. Furthermore, growing demand for bioagriculture products and rising population base is anticipated to upsurge revenue size. 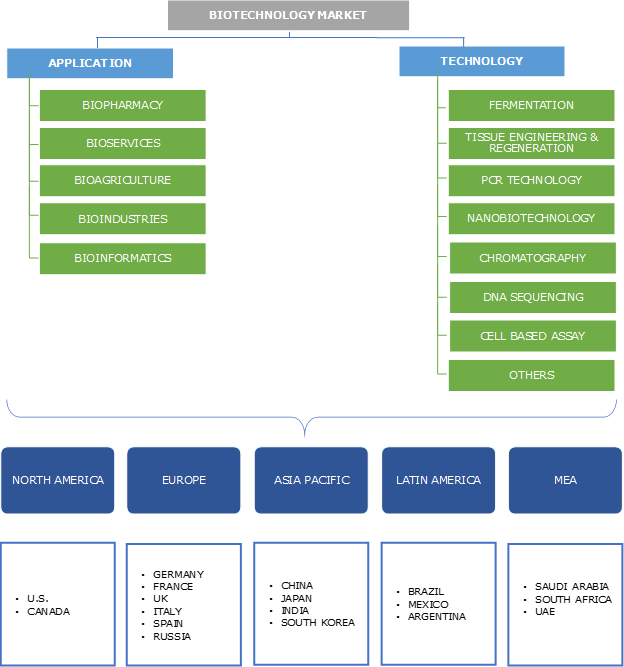 Some of the prominent business players operational in biotechnology market include Abbott Laboratories, Agilent Technologies, Amgen, Biogen Scientific, Bio-Rad Laboratories, Danaher, F. Hoffmann-La Roche, Illumina, Merck, PerkinElmer, Qiagen and Thermo Fisher Scientific. These business players implement strategic initiatives such as merger, new product launch and acquisitions to uphold their position in the market and strengthen their product offerings. For instance, May 2018, Illumina announced that it acquired Edico Genome that is a provider of data analysis speeding up solutions for next-generation sequencing (NGS). This acquisition is aimed to reduce time required for results. While the 1900s will be reminisced by industrial historians as ‘the Information Technology Era’ and also the ‘Advanced Physics Era’, the 2000s might be manifest by many as the ‘Biotechnology Era’. This is due to rapid developments in biotechnology that will entirely transform numerous aspects of life in imminent decades. However, the field of biotechnology can trace its accurate birth back to the beginning of civilization. When early man discovered ability to ferment grains to prepare alcoholic brews and also learned the utility of cross-pollinating harvests with the aim to produce novel hybrid strains being the most primitive form of genetic engineering. In modern period, scientists had nearly all rudimentary tools accessible for their applications. Through these tools mainstream of basic ideas were expounded; that accelerated the track to imperative scientific discoveries. These discoveries and studies have infinite applications and implications. Biotechnology has both destructive and beneficial potential. Opting it for humanity will bring major advances over the coming years.